»Culture»Is England Really Safer Due to Control? Apparently Not! Is England Really Safer Due to Control? Apparently Not! Summer’s End. Lexington Green, 11 September 2002. Photo taken in Minute Man National Historical Park. 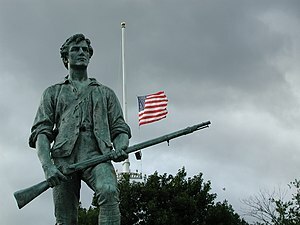 Now want us to trust them to do what is best for us by taking away our firearms which we own in order to protect ourselves from criminals and, if need be, to defend our liberties from attacks by all enemies foreign and domestic (note the Second Amendment had nothing to do with hunting). And they want us to trust that since they can’t do anything half way intelligent in all the above, they want us to now trust them that they will make us safe and secure and protect us from all evils, crime, and danger, if we will just surrender our firearms to them? What universe are they living in? Piers Morgan, point to England as having a much less violent culture than the U.S. since the UK banned all guns in 1997. Here are the first two UK newspaper reports my search produced. Do your own search. 2009: “UK is violent crime capital of Europe”. The United Kingdom is the violent crime capital of Europe and has one of the highest rates of violence in the world, worse even than America, according to new research.